Almost five months into the year and I had found my favorite film of 2013. 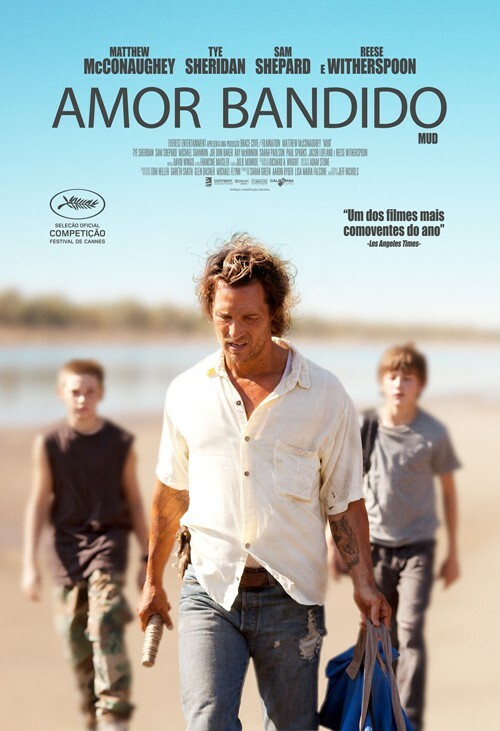 Watching “Mud”, writer/director Jeff Nichols‘ latest film was like turning the pages of an engrossing novel. It’s a somber tale that offers an authentic look at both teenage and adult relationships as the navigate their way around the perceptions of love. This is that rare film that takes its time with storytelling, patiently introducing viewers to well-developed characters played by actors who lose themselves in their roles as they inhabit an atmosphere that vacillates between innocence and mystery to cruel and thrilling. The immersive experience of watching “Mud” has lingered for days, weeks and months after its initial viewing, earning a greater appreciation upon further reflection. It takes place in the Deep South of Arkansas river country, an environment that almost feels like time forget. There are folks who make their livelihood off the Mississippi River, catching whatever fish they can from the houseboats they live on. It’s an intriguing subculture that have all but separated themselves from the nearby small town, but find time encroaching on their way of live. Fourteen year-old Ellis (Tye Sheridan “The Tree of Life”) is going through his own struggles as he watches his parents, Senior (Ray McKinnon “The Blind Side”) and Mary Beth (Sarah Paulson, “Martha Marcy May Marlene”), engage in tumultuous bursts of bitterness and frustration as their marriage dissolves. He spends most of his time with his best friend, Neckbone (outstanding newcomer, Jacob Lofland), riding around on dirt bikes or rummaging through scrap yards. They know everyone and everyone knows them. You get the idea that they’ve experienced things they think they understand and take it in stride, knowing nothing different. 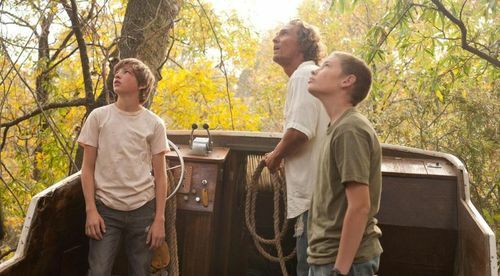 It’s not much of surprise then that one day the boys come across a boat that’s stuck up in a tree on an island in the river, most likely the result of a flood. They investigate, as boys of their nature are prone to do, and find that it’s inhabited by a man named Mud (Matthew McConaughey). Their hide their hesitancy, trying to keep their cool and eventually Ellis finds himself slowly drawn to the enigmatic character. Neckbone has his reservations though. Mud is a mystery man who convincingly spins impressive tales of magic and myth, while persuading the boys to help him with food and supplies, in order to get the boat back in the water. He is also a fugitive, holing up on the island in order to evade the law after killing a man. Mud is forthcoming with this information (even though we’re not sure what to believe) and proceeds to tell the boys of how he’s planning to reconnect with his girl, Juniper (a weary and worn Reese Witherspoon). Juniper is also holed up as well, in a nearby motel hiding from her brother, Carver (Paul Sparks), who’s determined to either bring Mud in or off him under the watching eye of his father, the intimidating King (a subdued and unsettling, Joe Don Baker). As Ellis’ connection to Mud increases, despite Neckbone’s misgivings, he also develops an infatuation for Mary Pearl (Bonnie Sturdivant), a local high school girl, after he punches out a boy who was harassing her. As Ellis intervenes in the broken and delusional relationship between Mud and Juniper, hoping to reunite what he perceives to be two people in love, he learns some devastating hard truths about vulnerability and the difficult challenges of love. While reeling from that confusion and the escalating strife with his parents, Ellis finds himself caught up in Carver’s pursuit of Mud, getting unexpected assistance from Tom Blankenship (Sam Shepard), the mysterious old hermit living across the river. “Mud” may seem like it’s taking place in a community isolated from the world we know, but we can nevertheless relate to the relationships we see here. That especially is true for the multiple father/son relationships Nichols has created, each one authentic and raw. It can be seen in the strained interaction between Senior and Ellis and the irresistible magnetism Mud has on the boy. There’s also Tom, who knows Mud more than he knows himself. It can also be found in the relationship Neckbone has with his Uncle Galen (a surprisingly gentle and funny Michael Shannon), who we assume to be his sole guardian. And there’s the uncertain dynamic (possibly domineering) the aging King has with his son. At no point does Nichols hit us over the head with his father/son threads. He allows them to unfold on their own, giving them their appropriate space or confinement to convey where they are in life. It could be said that the two prominent females (other than Ellis’ mother) in the movie are somewhat one-dimensional, but that’s not so. They are seen through the colored lens of the males that adore them. Mud has it in his head that he can just sweep Juniper up off her feet, as if he’s a knight in a white cotton shirt and a .45 stuffed in his blue jeans. Ellis is so enamored by Mary Pearl’s brief kindness, that he mistakes it for love (been there, brother!). Both characters have an inevitable turning point in the film, where they are faced with how things really are. For Mud, it’s likely a realization that he’s reminded of but had chosen to ignore, but for poor Ellis it’s a heartbreaking introduction of the complexities of love. 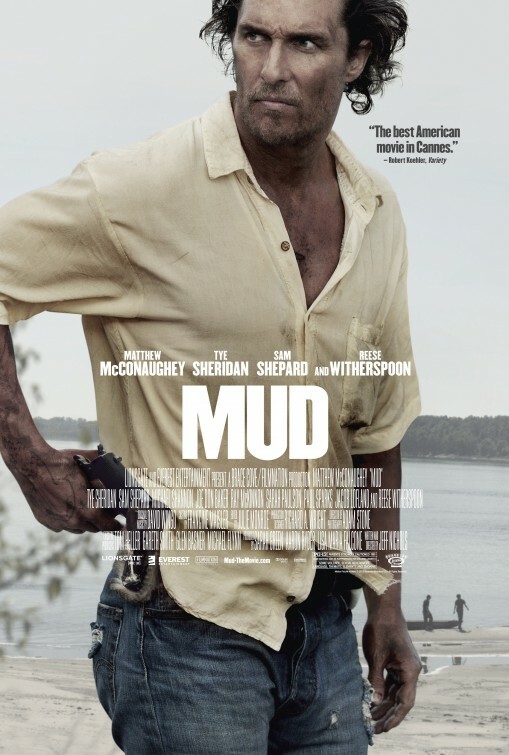 Beyond its superb portrayals of fathers and sons, “Mud” also reminds us of the snap judgements we often fall into. At first glance, a guy like Mud would be seen as the stereotypical drifter or the local derelict that every kid is told to stay away from. Witherspoon’s Juniper would most likely be seen as “white trash” or a tramp stuck in an endless cycle of bad decisions. But they’re not far off from you and me or people we know. While the story pulls the audience in, it’s the impressive performances by the spot-on cast that prove to be the highlight of the film. McConaughey has been hitting a career stride ever since “Lincoln Lawyer” (hopefully leaving all those insipid rom-coms in the past), with each role (be it big or small) proving to be just as noticeable as they next. This year seems to be just as good as last year for the actor and could possible earn him some year-end love once again. 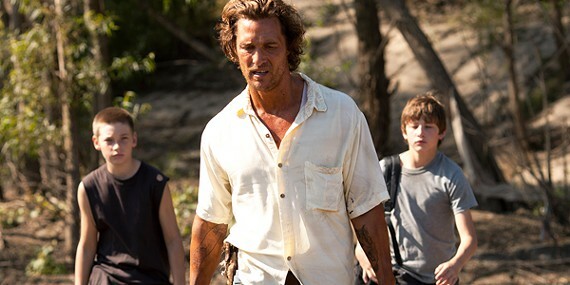 I suppose I was expected another great turn from McConaughey, who along with Shepard, fits in well with Nichols regulars Shannon and McKinnon (both played brothers in Nichols last film, the excellent “Take Shelter”), but the boys here offer some of the most memorable performances of the year, for me. Sheridan and Lofland are so natural and pure in their roles that, at times, it almost feel like a documentary following real kids. I couldn’t help but think of the characters Will Wheaton and River Phoenix in “Stand By Me” (a classic which has multiple parallels to “Mud”) as I watched these two. They exude the same brotherly bond that ignores the camera and simply live on-screen. Nichols, who grew up in this Arkansas river country, has written a screenplay that reminds us that there’s always more going on with these people, especially the key players. It’s a fine line that lets viewers notice the layers he accentuates as he allows the actors to work specific nuances on their own. The result is a Southern in the vein of a Twain tale (whom Nichols openly admits is a heavy influencer), offering something more what genre labelers will want to call a “coming-of-age” tale or a “crime thriller”. You can go there and call “Mud” either of those, but what stands out to me is its take on love and the agony of men (and boys) who have an undeveloped ability to communicate their emotions. The atmosphere and mood of “Mud” is complemented well by the talented artists that Nichols has employed on his other films. Cinematographer Adam Stone uses a Steadicam mostly, a handheld approach that is actually more fitting than it is annoying (as it usually is in other films). Composer David Wingo is also on hand, teaming with Ben Nichols (Jeff’s brother and frontman of the band Lucero) again to provide a fitting and resonant score. I can see Jeff Nichols working on future projects with the same artists, just as Spielberg or Eastwood has. “Mud” hit me just right and while I can understand how some are saying they wanted to like it more than they did or that it was a tad overlong – none of that mattered to me. In fact, I could’ve spent more time with these characters and the unfortunate situations they get themselves into. With just three full-length features under his belt, Jeff Nichols has easily become one of my favorite American writer/directors working today. Here in the UK, Mud got rave reviews from the critics, but didn’t make any money, nor did it secure a decent enough cinema release to allow me to see it. Your review however, has put it back on my radar and I am sure I will be checking it out ASAP.